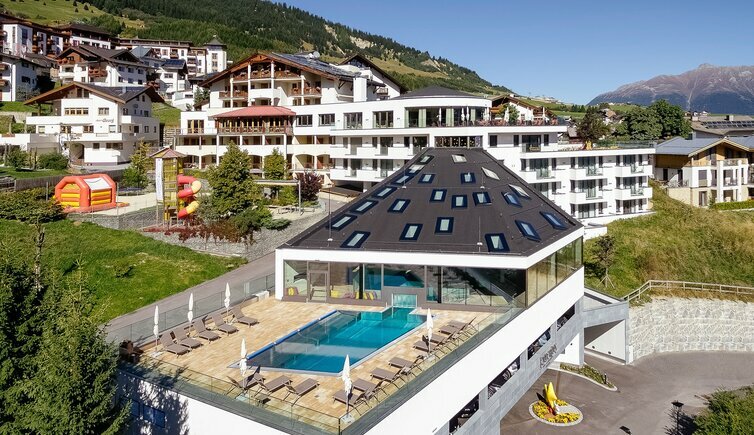 Under our motto „bei uns sind ALLE glücklich“ (everyone is happy), we invite you to experience our Laurentius-holiday-world. 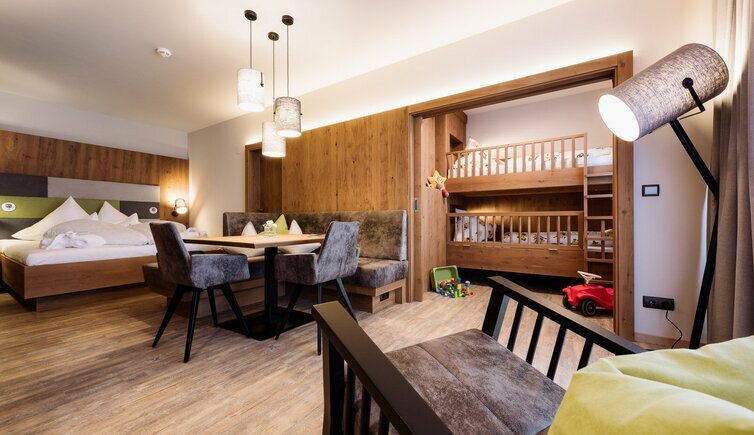 Our Baby- and Kids Hotel is located on a beautiful plateau right at the cable cars which run into the summer paradise of Serfaus-Fiss-Ladis. The cable cars, hiking busses and much more attractions are included in the Super.Summer.Card and available at the hotel - FREE OF CHARGE! 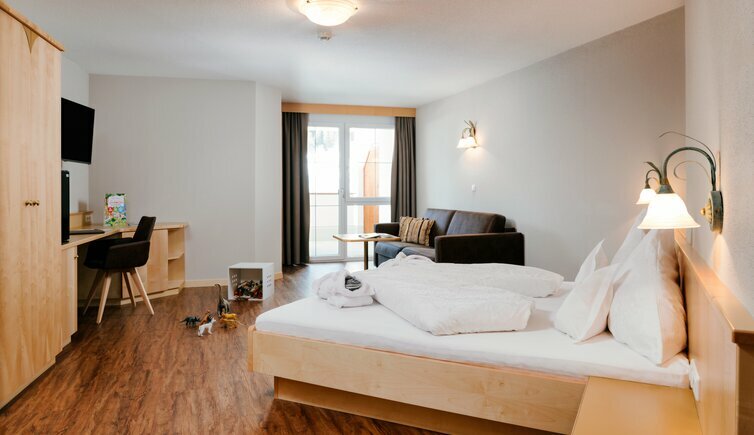 Spacious bedroom for parents, comfortable seating unit and a separate children’s room with a bunk bed (a fall protection can be applied to the lower bunk). Flat screen, radio, fridge, telephone, free Wi-Fi, baby listening device, safe, balcony, large bathroom with double washbasin, shower and bath tub, separate toilet, hairdryer, bathrobe, slippers, bag with bath towels. Flat screen, radio, fridge, telephone, Wi-Fi, baby listening device, safe, balcony, bathroom with shower or bath tub, some of them have a separate toilet, hairdryer, bathrobe, slippers, bag with bath towels. Spacious bedroom with seating and desk. Flat screen, radio, fridge, telephone, Wi-Fi, baby listening device, safe, balcony, bathroom with shower or bath tub, separate toilet, hairdryer, bathrobe, slippers, bag with bath towels. Flat screen, radio, fridge, telephone, Wi-Fi, baby listening device, safe, balcony, large bathroom with double washbasin, bath tub, separate toilet, hairdryer, bathrobe, slippers, bag with bath towels. Ideal for families with 1 child, Spacious bedroom with sofa bed. Flat screen, radio, fridge, telephone, Wi-Fi, baby listening device, safe, balcony, bathroom with shower - some also with tub, bidet and toilet. 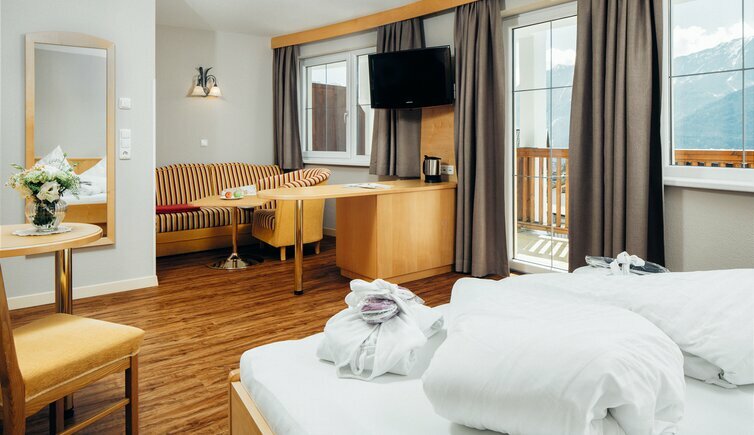 All our rooms are equipped with hairdryer, bathrobe, slippers, bag with bath towels. Spacious bedroom for parents, comfortable seating unit and with a sliding doorf separated children’s room with a bunk bed (a fall protection can be applied to the lower bunk). Flat screen, radio, fridge, telephone, free Wi-Fi, baby listening device, safe deposit, terrace, large bathroom with double washbasin, bathtub, separate toilet, hairdryer,bathrobe, slippers, bag with bath towels. 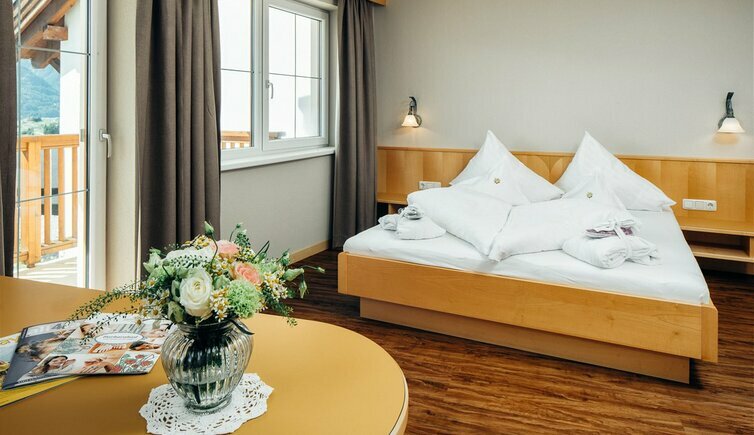 The Suite Abendstern is located on the groundfloor. Spacious bedroom featuring a cozy seating unit with TV, seperat childrens room with 2 bunk beds and TV. Bathroom with tub, shower and toilet. Very nice view over the village. Spacious bedroom featuring a cozy seating unit, a separate children’s room with a single and a bunk bed (a fall protection can be applied to the lower bunk). 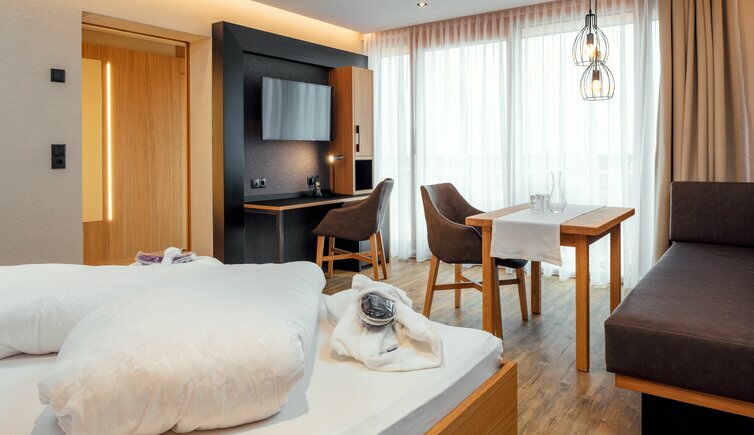 Flat screen, radio, fridge, telephone, Wi-Fi, baby listening device, safe, balcony, large bathroom with double washbasin, shower and bath tub, separate toilet, baby change unit, hairdryer, bathrobe, slippers, bag with bath towels. 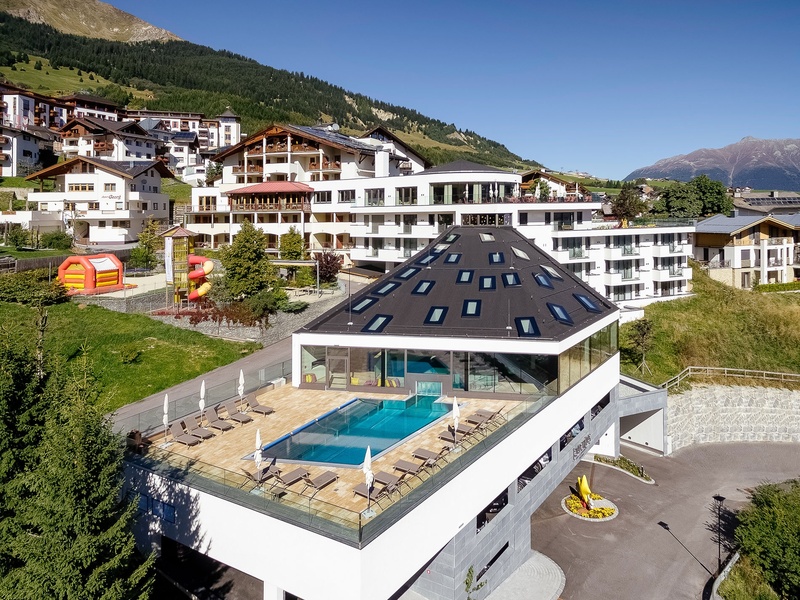 The Panoramasuite can be connected with 1 double room Sonne! 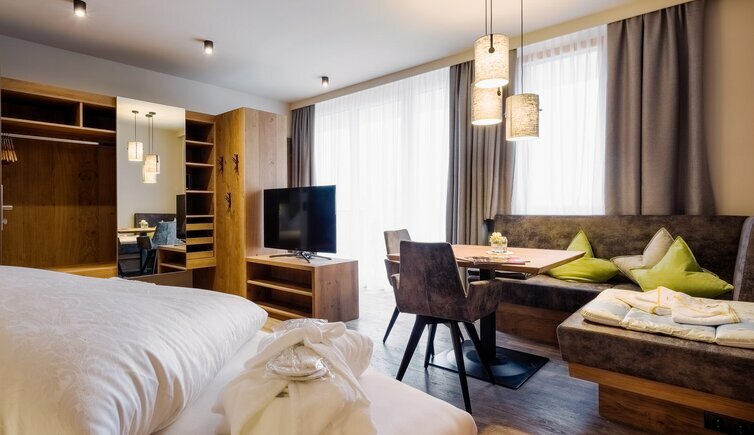 Flat screen, radio, fridge, telephone, Wi-Fi, baby listening device, safe, balcony, large bathroom with double washbasin, shower and bath tub, separate toilet, baby change unit, hairdryer, bathrobe, slippers, bag with bath towels. 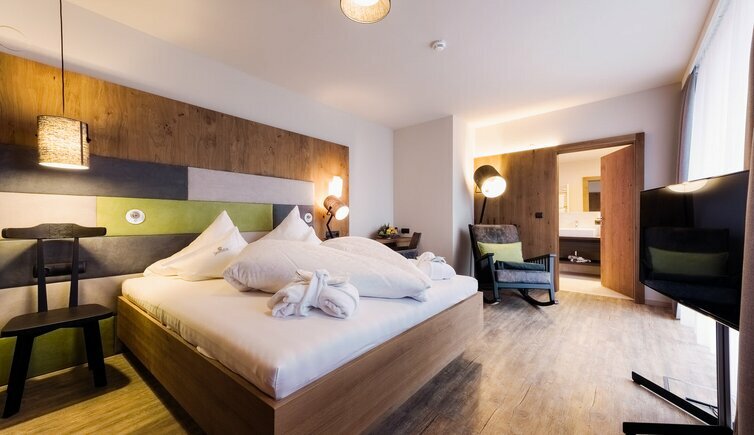 Flat screen, radio, fridge, telephone, free Wi-Fi, baby listening device, safe deposit, balcony, large bathroom with double washbasin, bathtub, separate toilet, hairdryer,bathrobe, slippers, bag with bath towels. 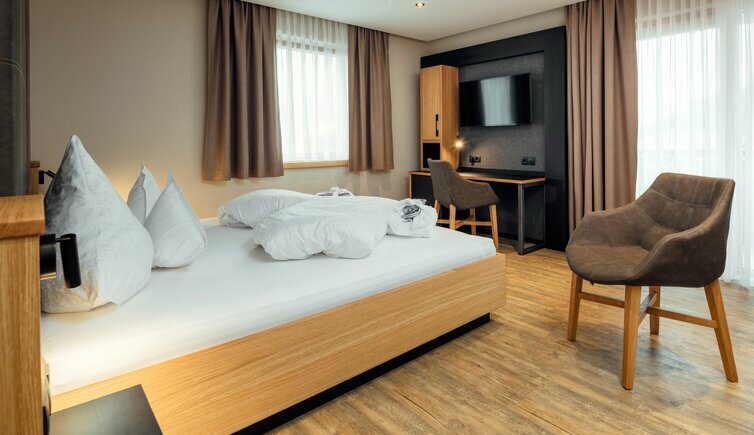 Spacious bedroom with a separate children’s room with a single and a bunk bed (a fall protection can be applied to the lower bunk). Flat screen, radio, fridge, telephone, Wi-Fi, baby listening device, safe, balcony, large bathroom with double washbasin, shower and bath tub, separate toilet, hairdryer,bathrobe, slippers, bag with bath towels. Excellent family hotel. Close to public transportation. Great pool. Leiteweg 26 - A - 6533 Fiss 1436 m a.s.l.